The first Teaser Promo was released before they had even started filming the rebooted Pilot Episode. On June 21, Lucas Till revealed the Premiere Date (September 23rd) to us in form of a teaser video clip; the premiere date formed by tools. The Teaser still used the old logo of the Unaired Pilot (with the SAK forming the “V”). Additionally, we got to see Lucas Till’s new haircut for the first time. For July, they used some more teaser clips (deleted by now) with scenes of the first trailer for the Pilot Episode. Otherwise, for the initial Reboot Promo it was all about the tools. 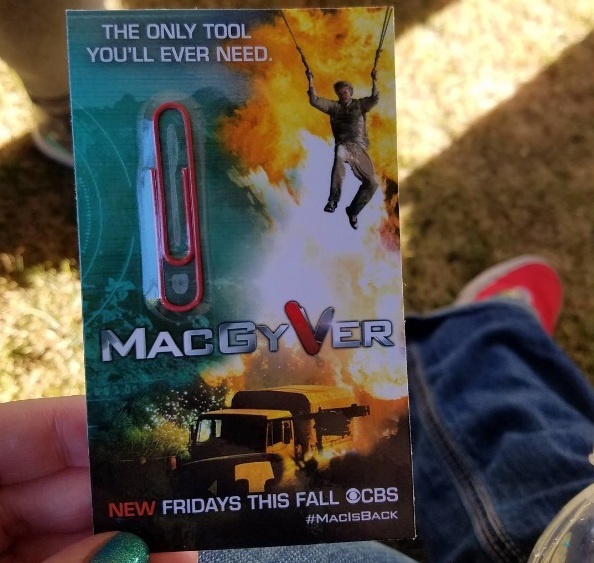 If you remember, they had handed out an updated version of the Original MacGyver Paperclip Tool at ComicCon San Diego. They used the original tagline “The only tool you’ll ever need” as well. On August 16, CBS released two new Teaser Clips. The first shows MacGyver teetering on two chair-legs at the edge of a skyscraper, certainly in danger of falling. But we didn’t need to worry, because “he’s got this”. The second one shows MacGyver tied to a chair, freeing himself with a paperclip. While I’m not so fond of the first clip, I’m still laughing about the second. No, it’s not really in line of Original MacGyver, but it was quite a clever way to catch the attention of a new potential audience. Also, the clips are a bit of an homage to the cheesy 80’s TV shows ads. The Teaser Promo got some negative comments by fans of the Original Show; most of them stating that rebooted MacGyver seemed too cocky. This was actually my first impression as well – but I liked the fact that it was MacGyver only and not “Team Phoenix” yet. However, I believe this is one of the reasons why so many fans of the original show were disappointed by the Pilot Episode. 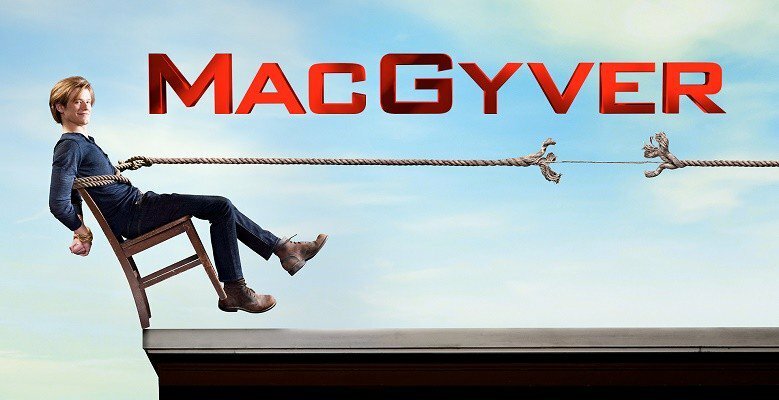 We already learnt in interviews during the promo tour that rebooted MacGyver isn’t a lone wolf anymore, but the Teaser Promo and the Press Tour Events (attended by George Eads as the only cast member besides Lucas Till) made it seem that the Reboot is more of a “buddy show” and that the team wouldn’t be as prominent as it turned out to be. Also, the paperclip as a tool seemed to be a much bigger thing in the beginning than at the end of the season. There’s a pretty funny BtS picture that Lucas Till posted on Instagram last September. It will be interesting to see if they’ll use the paperclip also as one of the important tools in Season 2. Executive Producer Peter Lenkov already promised they will keep the paperclip art (although they tended to forget it over the first season). A slightly different version of the paperclip teaser was used for the German Promo. Additionally, they made very short teaser clips for Facebook, adressing how MacGyver uses tools differently than other people do (e.g. using a paperclip as a key or a shoelace as a bungee rope). I don’t know about any other International Teaser Videos. Most European countries made their own trailers with scenes from the Pilot Episode. You can watch the Italian version (on Channel Rai2) here. The subject of the Teaser Promo was also used for International Promo on social media (e.g. Germany, Turkey, South Africa). The Facebook and Twitter Header shows MacGyver teetering on the edge again (although he’s wearing different clothes this time). 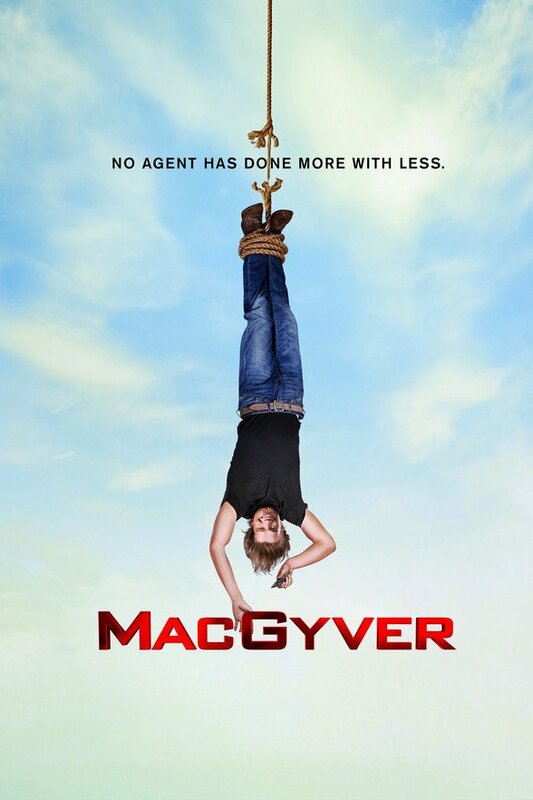 The Poster shows MacGyver hanging upside down, using the tagline “No agent has done more with less”. This tagline was also used in some of the US video teaser previews. I’m not sure if we’ll get another Teaser Promo for Season 2. It would be fun, though.